Origin: British breed, having been developed in England to guard the English estates against poachers. 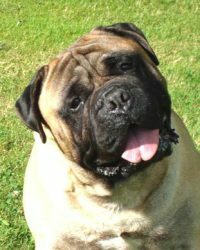 The bullmastiff and gamekeeper worked as a team patrolling the grounds during nighttime hours, ever watchful of one who would capture and steal game. During his early evolution, the breed was referred to as the ‘Gamekeepers Night Dog’. General Appearance: Powerful, strong, well muscled with heavy bone. Head is large and square with drop ears lying close to the face. Coat: Short and dense, usually double coated with a softer under coat and short slightly harsher outer hair that feels slightly bristly to the touch. Can be bathed with a good quality human shampoo whenever necessary. Clean ears regularly and keep nails short. Colours: Red, fawn, or brindle, always with a black facial mask. Temperament: Calm, and relatively easy to train. A happy dog with a certain sense of docility and quietly stoic. Usually not a ‘barker’. A good family pet but must always be respected as he is considered to be a guard dog. Must not ever be used as a child’s baby sitter. 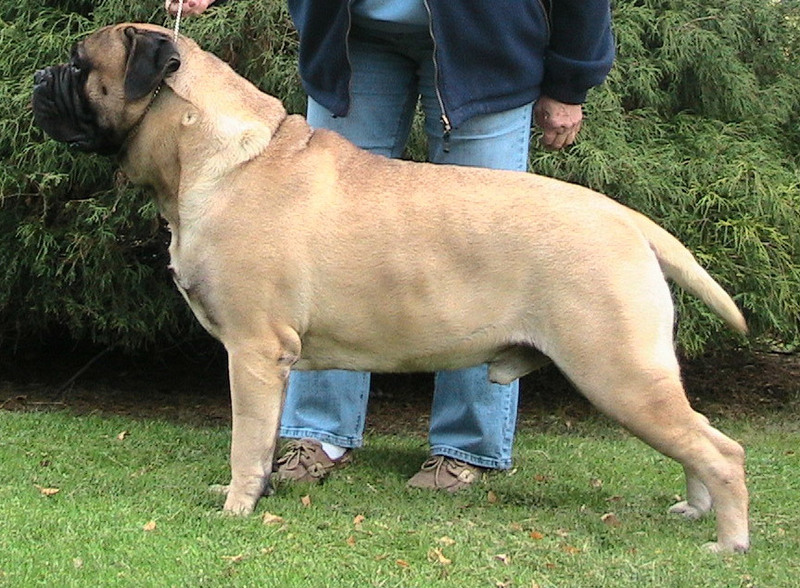 The adult bullmastiff might be intolerant of other strange dogs and many have a well developed prey drive. 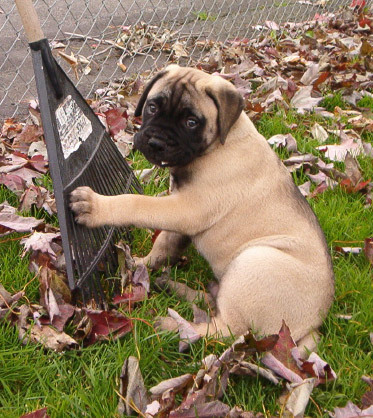 Activity: The Bullmastiff enjoys a walk with the family, but he is not a runner’s dog. They are capable of short bursts of speed, but not long distance. Puppies should not be forced to run or trot hard, doing so will damage growing tendons and ligaments. They enjoy chasing a ball or toy during play periods. Diet. Any good quality water softened kibble with adequate protein and fat. Always feed the adult twice a day. Do not allow free feeding. Crate Training: Absolutely essential during puppy stage and continue for short periods for the dog’s life. With consistency, easily house broken. Adjust crate size as puppy grows. Training & Obedience: Early obedience training highly recommended. Can also be successful in rally, tracking, and agility. Due to size and bulk may not be as quick as smaller breeds. Daily care: Must be confined in a fenced yard, never tied or chained outside. Cannot be housed outside. Must be part of a family unit.